Launched by Nvidia in 2016 as the world’s first supercomputer specifically designed for deep learning and big data analysis (which have witnessed explosive development in the last five years) the DGX-1 delivers 170 teraflops [around 200 times more powerful than your desktop computer] of processing power in a single box. Our new supercomputer(s) are part of a three year (2016-2019) joint industry-sponsored research project called DeepInsight (‘the Deep Learning Research Project on Big Video Analysis’) and are provided by Nvidia through their partners OCF. QMUL researchers, led by Professor Shaogong Gong, from the Computer Vision Group at EECS are collaborating on DeepInsight with two industrial partners SeeQuestor Ltd (part of the Anglo-Scientific Group) and Vision Semantics Ltd (a QMUL spin-out company developed from the computer vision group) to work with very large video data. Professor Gong’s research is also supported by a Royal Society Newton Advanced Fellowship Programme, on “Deep Learning for People Re-identification In-The-Wild” and, along with additional support from QMUL and partners in China, the project will support a second DGX-1 supercomputer and the work of several PhD students. Nvidia DGX-1 supercomputers are already installed at UC Berkeley and Stanford universities as well as OpenAI (the non-profit artificial intelligence research project backed by Elon Musk). 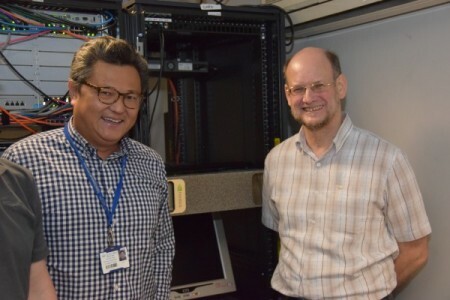 The installation (and testing) of the new computer, led by Tim Kay (pictured in image on right) and colleagues in QMUL’s Research IT team, has been supported by Nvidia Europe’s Chief Engineer Timothy Lanfear (pictured above with Prof. Shaogong Gong ).